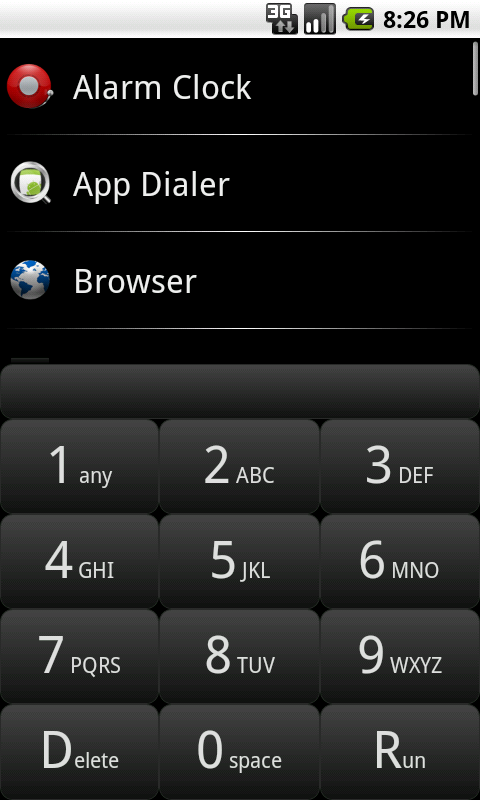 App dialer is an app launcher that can be used to find installed apps and start them very quickly. Today's Android devices have a lot of memory that users often spend on apps and games. Some users have as much as 400 applications installed on their device and navigating a list of apps or swiping between screens and screens of app icons just to find one can take a lot of time. App Dialer can be used to quickly filter a large list of apps down to just a few or even just one item in just a few seconds. 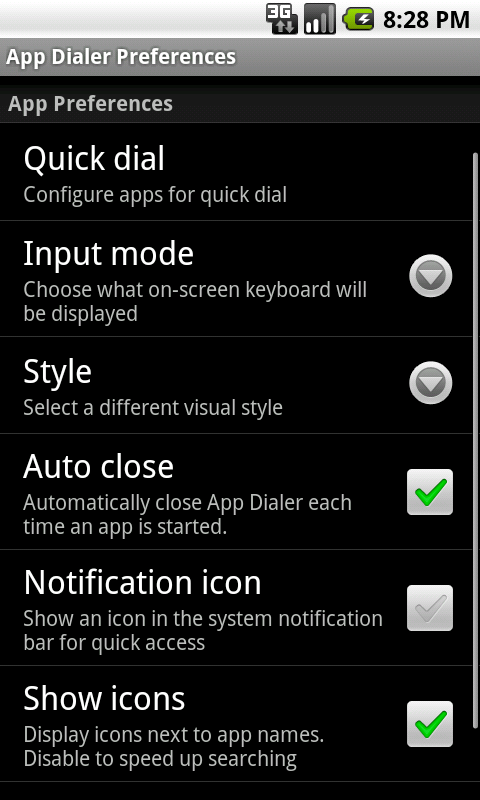 There are a few app launching apps out there but what sets App Dialer from the rest is the way app list is filtered. 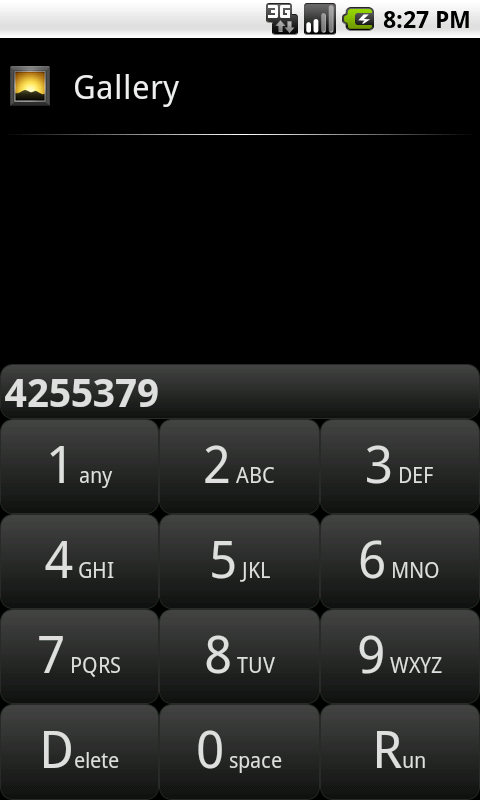 Instead of using an awkward on-screen QWERTY keyboard, App Dialer comes with a built-in numeric keyboard. You can just dial out apps' names just like you would dial a spellable phone number. Button 2 represents A, B or C, button 3 represents D, E or F, and so on. Want the Browser? 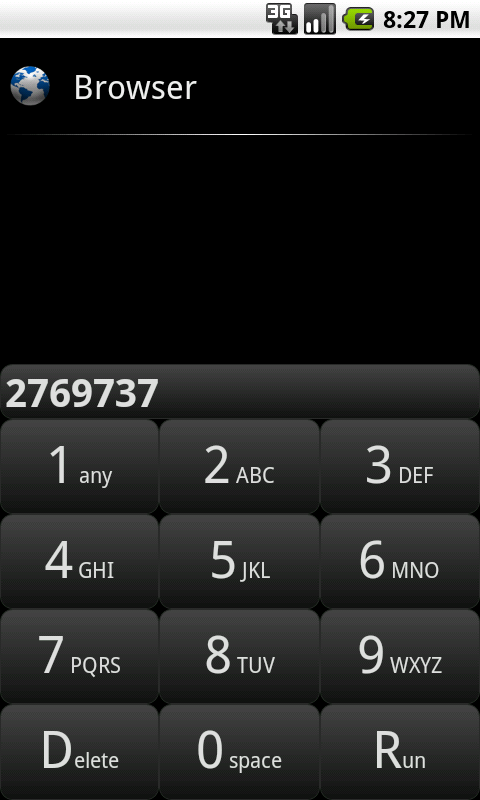 Dial 2769737 (spelled "browser"). Want the Gallery? Dial 4255379 (spelled "gallery"). It is that easy! Having a numeric keyboard means having big, easy to hit buttons that can be hit quickly and accurately with only one hand. The app list updates and shrinks as you dial so there is a great chance that you will not have to dial the complete name before the app is already going to appear on the top of the list. With some practice (you might already have years of practice writing SMS messages this way) you will be able to launch any app on your device in three seconds or less, regardless of how many apps you have installed. donation-supported, but otherwise free and ad-free! This app is completly free (it is a Christmas 2011 present to users of my apps). However it is donation-supported like all of my apps. If you find it useful, please consider donating.